Greg, if 7-up is the un-cola, could Dr. Pepper be the un-sanity? Um… Ok. Let’s take a look at a veiled take-down of the mental health profession as we review Unsane. We meet young Sawyer Valentini (Claire Foy), a woman who has recently moved 500 miles away from her hometown and is trying to establish a new life. She is depressed and seeks help from a psychiatrist, who commits Sawyer against her will to a mental institution. Sawyer’s efforts to escape only serve to convince the staff that she requires even more institutionalization. Her only friend in this hospital is a man named Nate (Jay Pharoah), who is spending four weeks there to recover from his opioid addiction. Sawyer has given in to the fact that she will have to spend a week held against her will, when she meets an orderly, George, who she claims is her stalker, David Strine (Joshua Leonard). Nobody believes her, least of all the audience. Sawyer is paranoid and explosively violent. But soon, String drugs Sawyer and we’re all in on it – Strine has followed Sawyer from Boston and is stalking her even in captivity. Now, Sawyer has to find a way out of her mental prison and escape this dangerous man. Greg, Unsane gives us a suspenseful depiction of a young woman’s involuntary incarceration in a mental hospital. This movie is packed with villains. There is the deranged stalker who makes life miserable for our hero. There are the evil hospital administrators who knowingly imprison Sawyer for profit. There is also the American healthcare system that incentivizes hospitals to ensnare captive victims such as our hero. This film is disturbing yet effective, and giant kudos go to Claire Foy who does a terrific job playing a tormented hero. This is as dark a hero’s journey as we’ve ever seen, Greg. At the outset of the story we see that our hero is struggling emotionally and socially. Attempting to get help from a psychiatrist totally backfires on her, and then we learn that her crazed stalker is in charge of dispensing her medications. She gets help from her mother and from Nate, both of whom are soon eliminated by the stalker. This is one of those films where the hero is left completely on her own and must summon inner reserves necessary to vanquish the villain. Sawyer musters the courage and grit to outwit her nemesis. Is she transformed by her harrowing experience? The film’s final scene suggests that she is not transformed, that she remains a slave to her inner demons. This lack of transformation represents a deviation from the normal hero story pattern, and I think it was done intentionally to underscore the deep scarring of sexual violence in our society. Sawyer should most certainly not simply go on with her life as if nothing had happened. To do so would diminish the trauma and seriousness of this deep societal problem. Scott, this movie gave me flashbacks to Misery. We have an unwelcome admirer who uses a medical condition to trap our hero. There’s even a scene where the villain, Strine, hobbles our hero by smashing her ankles with a hammer. Otherwise, I thought this a skillfully played ‘cause’ film – a film that wants to promote a cause through storytelling. 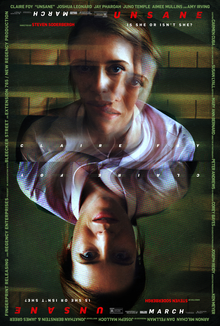 Unlike other cause films (such as 2016 The Promise which did a terrible job of exposing Armenian genocide), Unsane focuses on delivering a psychological thriller while at the same time exposing corruption in the mental health system. Unsane shines a light on mental health at a time when there is much lip-service paid to it in the United States. Unsane is a first-rate thriller that had me on the edge of my seat and had my heart pounding. It is predictable in spots – do we ever doubt that Nate will bite the dust? But despite a few lapses, Unsane soars on the strength of its star, Claire Foy. She shines in the role and gives us a searingly convincing victim of stalking and harassment. Unsane deserves a rating of 4 Reels out of 5. As I’ve noted, Sawyer’s hero’s journey is among the darkest and grimmest we’ve seen in quite a while. We just reviewed Tomb Raider and commended the physicality of its star Alicia Vikander. In Unsane, similar commendations go to Claire Foy, who exudes a remarkable physical presence in combating her fellow patients, hospital staff, and stalker. Sawyer also has many of the Great Eight traits of heroes — she is smart, strong, resilient, reliable, and inspiring. Is she caring and selfless, too? Yes, as she shows compassion for her mother and for Nate. I give her 4 Hero points out of 5. Several archetypes do stand out in this film: the innocent victim, the evil corporation, the deranged stalker, the guilt-mongering mother, and the slain ally to the hero. I award them 3 archetype Arcs out of 5. Unsane is an interesting movie for a couple of reasons. First, it has long uncut scenes of mostly dialog. Second, it was filmed completely on an iPhone 7 by writer/director Steven Soderbergh. 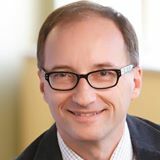 Soderbergh is known for creating minimalistic and experimental works. See his project Mosaic – a choose-your-own adventure for mobile viewers. I was impressed with the accomplishment of creating a good psychological thriller with a minimum of overhead. I give Unsane 4 out of 5 Reels. Sawyer is the epitome of the unreliable narrator. She is psychologically damaged. And she very well should have been committed for observation. But when she sees her stalker nobody, not even we, believe her. Even though we know she is damaged, we are pulling for her because we see she is strong and resilient – two qualities we look for in a hero. I give her 4 out of 5 Heroes. For archetypes, I’ll see your INNOCENT VICTIM and raise you a WITLESS DOCTOR who is a COG IN THE MACHINE along with the EVIL ADMINISTRATOR. I give them 3 out of 5 Arcs. By Greg Smith in 2018, 3 Archetypes, 4 Heroes, 4 Reels, Horror, Thriller on March 27, 2018 . I didn’t realize this was shot on an iPhone. Very interesting. One note: Strine was played by Joshua Leonard not Walter Goggins. I was kind of expecting a second twist at the end where we realize she was insane after convincing us she wasn’t. But, I think the ending was good, and also highlighted an issue that is very prevalent now, PTSD. Thanks for the tip. Yeah, it’s an interesting movie. Not only PTSD but also mental illness and stalking. It’s almost too many social issues in one movie. But as a thriller, it was nicely done.